I am a consumer of media. I buy books, music and film DVDs regularly. I tend to scribble down things I want to buy when they are recommended to me or when I am inspired by advertising or reviews. Now and again I'll sit at a PC on the Amazon site and try to find all my little notes so I can buy them all. There are two problems with this approach. Firstly, I have more than once bought items I already own. And secondly, I often neglect once I own an item to read, watch or listen to it. My media wishlist page solves the problem. In the 'Type' column I can put a code (B = book, CD = er ... CD.) Each title has two checkboxes: one for when I buy it, the second for when I read, watch or listen to it. 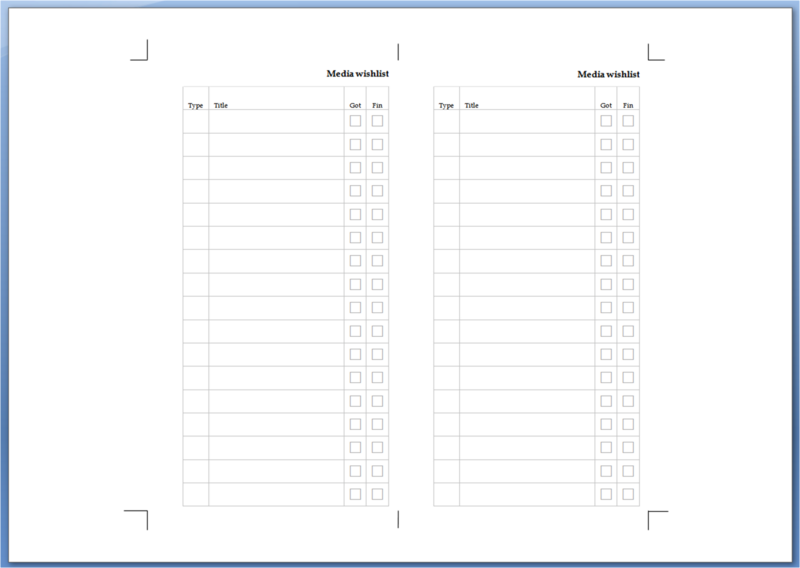 If you would like to use the media wishlist too, you can download either an editable Word file or an Adobe PDF file. 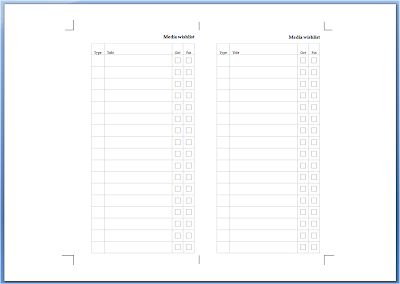 As soon as this page was tucked into my Filofax, I started thinking of other applications for the double check box. For instance, how about a delegation record, where the first box records you assigning the task, the second checking it is complete? Or perhaps a correspondence record, the first box recording a sent letter, the second the receipt of a reply?